or add a Cruise Control! 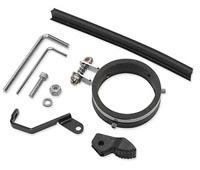 CM-1: The CM-1 motorcycle cruise assist is a very easy to use aftermarket throttle assist for Harley-Davidson motorcycles. It allows the rider to relieve the constant pressure required to hold your throttle open, helps relieve carpel tunnel syndrome and many other hand, wrist, arm, shoulder issues while riding. Note: Requires enlarging the threaded hole for the original equipment star wheel throttle lock. Installation kit included. With a simple flip of your thumb (typically 1/4 turn or less) you can set your throttle where you want it, and you can still operate throttle with the CM-1 set! All internal components are manufactured from 303 stainless steel and the handle is die cast zinc (not plastic) with either black powder coat or nickel chrome finish. OEM lifetime warranty; even if the chrome peels, it will replace it for free! CB-1: The Cruise Buddy replaces the stock throttle wheel tensioning device on H-D's that are not equipped with electronic cruise control. The stock thumb wheel has to be turned multiple times. The unit does not change the internal friction spring or the intent of operation. 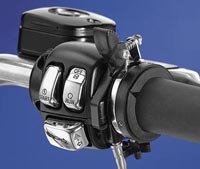 Very simply, the CB-1 eliminates the need to remove your hand from the handlebars to adjust throttle tension. Once installed the CB-1 is engaged and more importantly disengaged with a touch of your thumb. 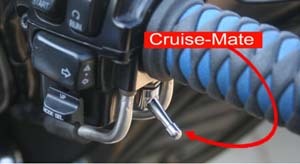 The Cruise Buddy is easier to use, so you use it more to reduce fatigue on long rides. CC-46: Cruise control for 1990 and later Harley models. Made from durable Zytel nylon. Easily installs in minutes without grip removal. Simple thumb level on/off operation. Eliminates hadn and wrist fatique on long rides.